The word Yaw-Yan was derived from the two last syllables of “Sayaw ng Kamatayan” meaning “Dance of Death”. The art resembles Muay Thai in a sense, but differs in the hip torquing motion as well as downward-cutting of its kicks. ArDigma means for arnis (stick), pandigma (warfare). Arnis is generally classified into solo olisi (single stick) or double olisi (double stick), but in ArDigma, it is a version of arnis without a stick because we use the forearm and shin as a stick. Hybrid FMA offers Yaw-Yan ArDigma classes in London, under the instructorship of Master Ermar Alexander, personally trained by Master Ekin Caniga in the Yaw-Yan ArDigma Headquarters in Cebu, Philippines. Yaw-yan is a Filipino martial art developed by Grandmaster Napoleon A. Fernandez, a native of Quezon province, himself an undefeated All-Asian and Far-East Kickboxing champion. Since its inception it has dominated the kickboxing scene in the Philippines and has proven very effective against other Stand-up fighting arts such as Karate, Taekwondo and Muay Thai in professional bouts in the Philippines. ArDigma is the new system that Grandmaster Napoleon “Nap” A. Fernandez created to counter other martial arts such as grappling, jujitsu, and wrestling take downs. The idea is to harden the forearm and shin to use as club when an opponent shoots for the take down. This will also be used when inside of a guard to strike the opponent at close range. Yaw-Yan ArDigma teaches various techniques to use every part of a strong and healthy body as weapons, not just the fist (kamao), knees (tuhod), shin (lulod), feet (paa), soler (talampakan), head (ulo), and even the calf (bangkod) to attack and defend because any part of the body can play a decisive role in a fight and knock down the opponent. 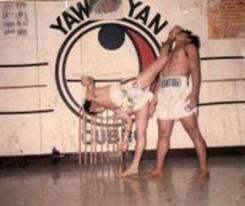 Yaw-Yan is not purely a full-contact no-holds barred sport martial arts. It is a complete martial training with body-mind coordination and test of enduring indomitable spirit. More than just physical training, it also involves the mental disciplines of focus, concentration, alertness, flexibility, stamina, speed and continuity. Advanced disciples have to go through a rigorous ritual of practice and discipline consisting of actual full-contact sparring, bag hitting, and flexibility exercises. The elbows, knees, and shin are utilized in much the same way as in Muay Thai. Yaw-Yan practitioners have to learn 40 basic kicks, advanced disciples have to be able to execute and apply complex advanced kicks requiring great dexterity, flexibility, and mastery. Most of these advanced kicks are trick kicks could catch unsuspecting opponents by surprise. Yaw-Yan practitioners are also train with Philippine bladed weaponries as butterfly knife or known as “balisong” or bolo. Bladed weapons are treated as extensions of the hands. The forearm strikes, elbows, punches, dominating palms, and hand movements are empty-hand translations of the bladed weapons. There are 12 bolo punches which were patterned from Arnis, the Philippines’ very own armed art. These punches have continuous fluid striking motion quite similar to western boxing but incorporating the art of Arnis. Grappling, ground-fighting, and knife-fighting had always been a part of the Philippines’ martial art and are always incorporated during the Yaw-Yan practice period. Yaw-Yan fighters have been known for breaking their opponent’s strong femur bone if not the ribs or jaw, with one mountain storm kick. Yaw-Yan is a transformation of ancient Filipino Martial Arts and a Modern Competition Sport with high emphasis on practicality and actual confrontation.